WHO IS DAVID RUDISHA, KENYA’S DOUBLE OLYMPIC CHAMPION? Four years after London 2012, David Rudisha has delivered again for Kenya. The 800 meter runner won the East African country’s second gold medal of the 2016 Olympic Games in Rio de Janeiro with a towering run, clocking a time of 1:42.15. 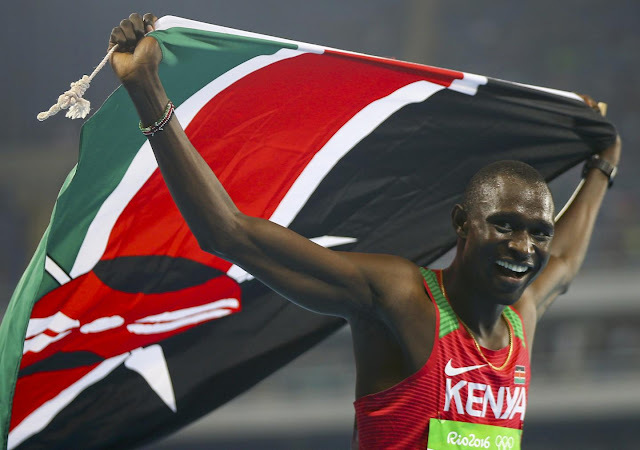 Rudisha overcame a strange race—during which compatriot Alfred Kipketer sprinted clear in the first lap, disrupting Rudisha’s usual rhythm of leading from the front—to become the first athlete since 1964 to retain the men’s 800 meter crown. As well as now being a double Olympic champion, 27-year-old Rudisha holds the past two titles from the 2011 and 2015 World Championships. The Kenyan has also broke the world record three times, with his current best sitting at 1:40.91, obtained at London 2012. But he was adamant that his run in Rio was his best achievement yet. “It is the greatest moment of my career,” said Rudisha, the BBC reported. Known as the King in his homeland, Rudisha was born as a member of the Maasai tribe in Narok County, southwest Kenya. The runner was nurtured by Colm O’Connell, a 67-year-old Irish missionary who has coached several Olympic and world champion athletes in the remote Kenyan town of Iten, despite having no prior coaching experience. The son of Daniel Rudisha—himself a silver medalist in the 4x400 meter relay at the 1968 Olympics in Mexico City—the Olympic champion is the father of two daughters and also serves as a police officer through Kenya’s national service program. Rudisha won his first international medal at the 2006 World Junior Championships in Beijing and has continued to accumulate medals and accolades since then. He was named the male Athlete of the Year in 2010 by the International Association of Athletics Federations (IAAF), intersecting a five-year streak of Jamaican sprinter Usain Bolt picking up the gong. Kenyan athletics has been plunged into a crisis by allegations of doping and corruption that have persisted in recent years. The country narrowly avoided a ban on its track and field athletes competing in Rio after implementing new anti-doping legislation in June to comply with an order from the World Anti-Doping Agency (WADA). But Kenya remains dogged by the allegations and scores of athletes have been banned in recent years for taking performance-enhancing substances. Controversy has not gone away in Rio, with Kenyan middle-distance running coach John Anzrah being sent home after reportedly posing as an athlete for a drugs test. Another coach, Michael Rotich, was recalled from Rio after an investigation by The Sunday Times and German broadcaster ARD found that he had solicited $13,000 bribes to warn other coaches in advance about upcoming drugs tests.